Do you have grandmothers who get holiday cheesy with weird games and quirky traditions come Thanksgiving and Christmas time? I do! And I love her to bits. God bless you grandma Viv. And while I used to give the ol’ eye roll and emphatic shoulder shrug in the midst of my moody teen years toward her festive ideas, I find that I am becoming more and more like her the older I get. Our holidays are starting to resemble what I grew up with. And you should know, despite my outward self-consciousness I secretly loved it all. I even found a lace tablecloth this week, just like the one she has! I am not going to cover mine with clear plastic, although the thought did cross my mind. However, I have decided it’s going to be our special occasion table cloth, so when it’s out everyone will know our meal is going to be a special one. It’s interesting and beautiful just how much of our childhood shapes who we become, and how many of those experiences, whether we want them to or not leave their mark on us. One year after having our meal at a table like the one above, my family played Christmas charades conducted by my grandma. The bowl eventually made its way to my grandpa John, and he drew a slip of paper with the words, “yule log” scribbled on it in cursive. After reading it a fews time, he got down on the carpet, old knees and all, and laid there like a good sport for what felt like forever being a yule log. No one could figure out what he was doing! With the entire room belly laughing and trying to guess what he was, he eventually rolled over and had to tell us, with tears in his eyes from chuckling so hard. Clearly grandma didn’t think that one through, or maybe she did, and planned to give it to my grandpa all along to give us all a good laugh. Either way, it was hilarious and memorable, and stamped its way into my brain. Turns out, cheesy is really fun. And I haven’t even gotten into the plays we used to put on where my dad was instructed to be the donkey, I as Mary on his back, my cousin as Joseph, and my uncles as the three wise men in Burger King hats with blankets over their shoulders as we reenacted the nativity scene on the fireplace. Now that things have come full circle and we have little ones running around our home and family staying with us, I want to play weird games and have quirky traditions around the table and in the living room after we eat. I want to fill our holiday season with simple but meaningful things that give us a chance to pause and give thanks for all that we have, for the lessons we’ve learned, and for the hope swelling inside. Perhaps it’s the forever teacher inside of me taking the lead? Perhaps it’s because my grandparents are aging and sadly, some of them forgetting. Perhaps it’s because life seems to be racing by these days, no one fitting into onesies anymore. I chalk it up to all of that, plus because it’s who I am, and genuinely proud to be: a woman like her grandmothers, who loves to host and make her guests feel special. 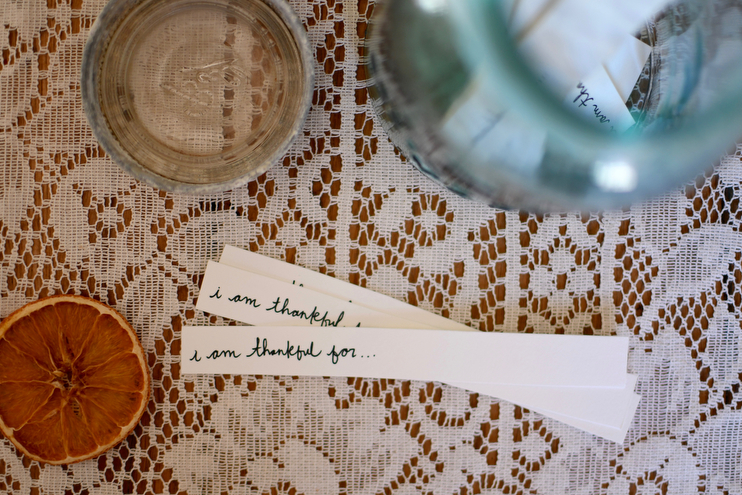 This thankful jar idea was one I conjured up while thumbing through of Susan Branch’s books (the delightful Autumn one I think everyone should own) whilst finalizing our Thanksgiving menu this past weekend. Andrew and I are hosting both of our parents and some friends this year, and while there will not be a ton of us gathered round the table, I want to make it memorable. We are having the whole shebang because I can’t help myself: starting with a seasonal salad, then onto turkey, stuffing, mashed potatoes, sweet potatoes, cranberries, gravy, rolls, and green bean casserole, and ending things with a pear crumble. Because I’ve never been able to restrain myself to the constraints of a recipe, I have decided to put a tiny twist on everything, keeping the meal semi-traditional but with something extra to keep everyone on their toes. Feeding those I love is one of the ways I know how to love best, so putting time and care into our meal goes beyond “supper’s ready, come and get it!” Instead, it’s a way of me saying, “I love you, I care about you, and hope you have a beautiful holiday with us.” I am going to wear my apron, I going to make everyone play turkey day charades, and it’s going to be very cheesy, and I am going to love it. Onto the jar I was supposed to tell you about! It seems I am in quite the writing mood this morning. This jar is a new tradition out family is starting this year. I named it our Oh, So Thankful Jar because I like that little pause in the middle. This jar is an antique blue Mason I thrifted down the street a few months back, and is perfect for holding gratitude’s. It appears the lid has been through hell and back, but it works. Last Sunday afternoon I cut up pieces of old calendar paper, and on the back wrote, “I am thankful for…” – several slips of paper for each person attending. We decided that at the beginning of Thanksgiving day when everyone arrives, each person will get several slips of paper to add to the jar. Giving the paper out early ensures plenty of time to think and write, so no one is put on the spot. 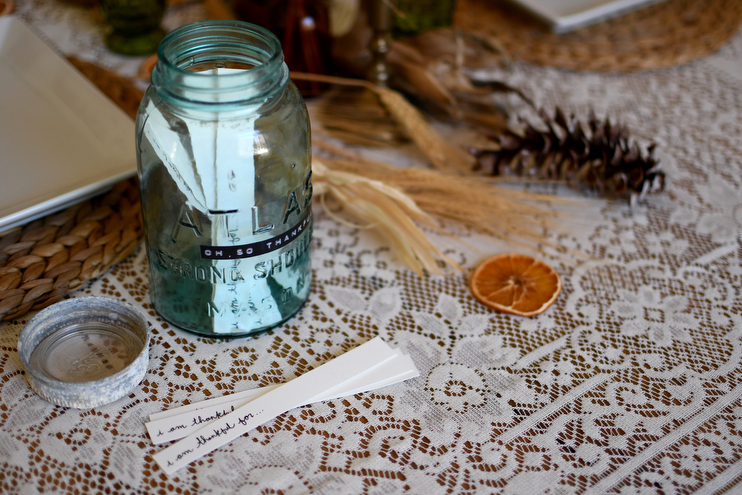 Throughout the morning before we all gather around to eat our meal, each person will fill out their slips of paper and toss them into the jar. During our meal, each of us will take turns pulling out and reading everyone’s gratuities and blessings in between the passing of bowls and plates and bottles of wine. It’s a simple but intentional way to connect our hearts to the meaning behind the meal. I am going to call it right now that Andrew adds something witty to that jar. I don’t know what it will be, but I can always count on him to make everyone smile. And I’ll probably end up being the person to read that little slip of paper, because God has the best sense of humor. Taking time to name our blessings and share them with others is exactly what I feel this holiday and season embodies. We are going to save each one of our thankful slips of paper each year and keep adding to this old blue jar. I love the idea of it getting fuller each year; there is just so much we have to be thankful for. If you care to make one, you can label it however you’d like. I used my DYMO embossing labeler, because I use it for everything and like how old-fashioned it is. 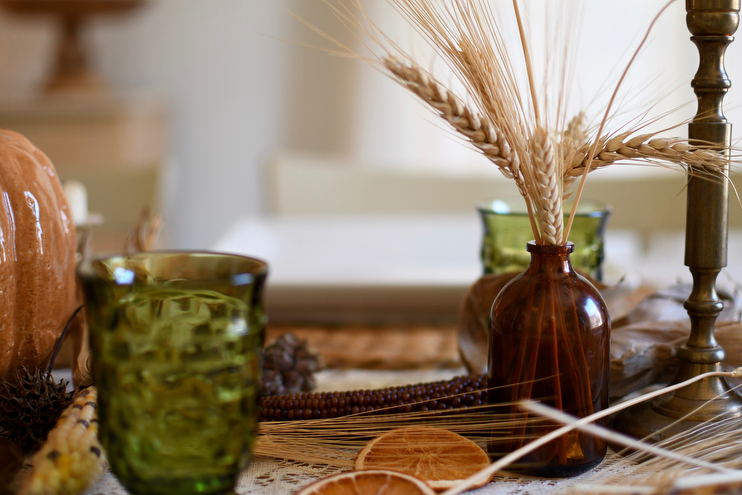 Onto a few ways you can add a little something extra to your traditional Thanksgiving recipes. These are not the full recipes mind you, but rather some inspiration for you if you’re looking to add some small changes to already familiar recipes. Here is my full meal plan! I plan on starting this meal today with my mother in law Carol, and doing bit by bit until Thursday morning. You can make ahead any of the sides that have a * next to them, and they should keep for the big day. I hope you all have a blessed holiday with those you love, and as always, thank you for taking the time to stop by and read. Shawna, I use this Epicurious recipe but also add about a 1/2 cup of sour cream and some parmesan cheese!